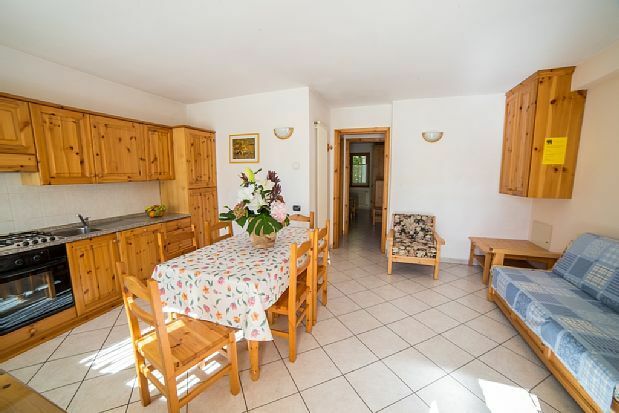 The apartment is around 60 meters for up to 7 people provided with living-room, kitchen, 2 bedrooms, 1 bathrooms and private underground parking place and cellar ski-box. There is a private balcony. The living room has a sofa, plus a dining table and chairs. APARTMENTS - Two-rooms: with 4-5 sleeps (a kitchen-living, a double bedroom and a bathroom).- Three-rooms: with 6-7 sleeps(a kitchen-living, two double bedrooms and one bathroom).- Four-rooms: with 8-9 sleeps (a kitchen-living, three double bedrooms and two bathrooms).- Five-rooms: with 10 - 12 sleeps (four bedrooms, three bathrooms and kitchen-living with dishwasher, small chimney, TV. Each apartment is provided with a: - bathroom (with shower and washing-machine) - living-room (with dish-washer, electric oven, refrigerator-freezer, small chimney, TV) - underground parking place - cellar ski-box - A private meadow or a balcony belongs to each apartment - Very accurate furnishing in Aosta Valley rustic style - The apartments at the ground floor are also suitable for people with physical difficulties. - Animals are accepted.